Sure, they are worth seeing and exploring, but they can get ridiculously busy with crowds, especially during the high season. So, there is no wonder that lots of avid travellers prefer to get off the beaten track and hunt down the hidden gems that most average tourists won’t go to. These will be a lot more peaceful, and some will even give you the chance to experience the country as a true local. One of the best regions in the world for exploring hidden gems has to be Southeast Asia. It is an area that is well trodden by tourists and backpackers, and the main tourist sites can undoubtedly end up very busy and chaotic. However, if you step away from the beaten track, I’m sure you will be able to discover some real treats. Take these fantastic ones, for instance. Thailand has to be one of the most popular destinations for tourists in Southeast Asia, and all of its main attractions and sights can end up really crowded. However, there are still some attractions where you can escape all the crowds. Just take Doi Mae Salong as an example. This town is right next to the country’s border with Myanmar. You will notice a lot of influence from many of the Chinese who have chosen to settle in Myanmar. In fact, you might think that you have somehow ended up in China thanks to this little town fantastic tea traders! If you are planning on heading to Indonesia anytime soon, you should take a look at https://www.rumah.com/rumah-dijual/di-area-depok-idjb10/dibawah-200juta-rupiah for some accommodation in the Depok area of the Java province. Sure, there are lots of big attractions located on this island, including the world-famous Borobudur Temple. However, if you get out and about, you will realise that there’s so much more to discover. For instance, you could head out to Biawak Island, just off the West coast. Here, you’ll find the monitor lizard, a close relation to its more famous cousin, the Komodo dragon. Try and Google the Cardamom Mountains and see what you come up with. You might be surprised to see that there is still very little information about this amazing place anywhere online. So, if you are in Cambodia and want to find a hidden gem, the Cardamom Mountains really are your best bet. Not only is this area great for biodiversity, but it is also one of the only wild elephant corridors anywhere in the world. If you fancy doing some good during your trip, you can even volunteer with a program based in the mountains that aims to replant trees. It’s a fantastic destination for hikers, as this is where you will find the trail up to Cambodia’s highest peak! The Philippines is made up of around 7,000 islands, so there is no wonder that there are many natural wonders and stunning hidden gems, including rice paddies, beaches, and dense forests, throughout the whole country. One of the best, though, has to be Mount Pinatubo, a large volcano that last erupted in 1991. Since that eruption, there has been a large crater at the peak of the mountain that is now filled with a beautiful lake. It will take a few hours to trek all the way up to the lake but, believe me, it certainly is worth it. Some people head up in the early hours of the morning so that they can then watch the gorgeous sunrise from the top of the mountain. While you are hiking up the mountain, you might even get to spot some of the indigenous people who live here, the Aeta tribe. 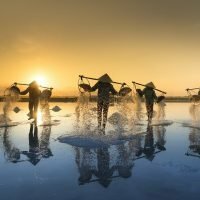 Vietnam is another very popular country for tourists in Southeast Asia. Lots of tourists spend a lot of their time on the coast. There are so many beautiful beaches and gorgeous small coves, there really is no wonder that tourists flock to them. However, if you want to visit the hidden gems, you might not be too keen on joining the crowds at the beach. Thankfully, though, there is one that doesn’t attract too many people despite how beautiful it is. Ke Ga is a couple of hours’ drive from Ho Chi Minh City, so it’s a bit out of the way for most tourists. It will feel like you are on your own tropical beach! If you are planning on travelling to Myanmar, make sure you stop off in Hsipaw. This town is the place to be if you want to go on an organized trek that is more authentic than the usual tourist-pleasing ones that you may join in some of the larger towns and cities, like http://www.myanmartrekking.com. Of course, it’s worth visiting even if you want to explore on your own treks, as there are some thrilling hikes that you can do around the small town. There’s also some great history to discover in the town as it was once a Shan royal city. Sure, people have heard of Vientiane as it’s the capital city, but that doesn’t mean it’s not underrated. In fact, when you arrive, you might wonder where all the other tourists are! Most tourists simply travel through this city, but there is so much more to hang around for. For instance, you could visit the Wat Si Saket Temple or see the Victory Gate war memorial. There will also be plenty of delicious food to eat, and it’s well worth taking a pit stop at one of the street-food markets you’ll no doubt come across. So, which of these hidden gems in Southeast Asia do you fancy visiting now? No matter where you go or what you see and do, you won’t be disappointed!